Discussion in 'Home, Auto, Hobby and Computer Tech' started by crosscreekcooter, Aug 24, 2016. 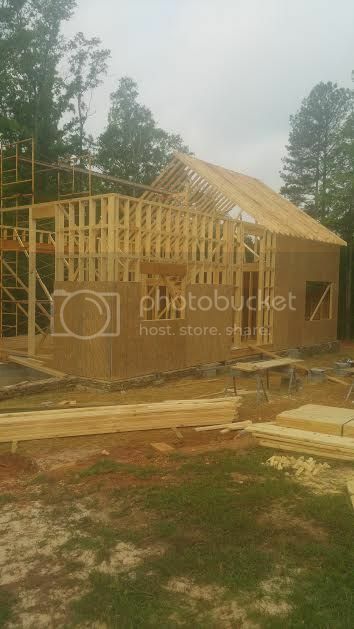 I have a friend that's building a cabin near Augusta and is planning to incorporate exposed timber frame roof components into the construction. He is looking for either pine, cypress, or w red cedar. Ideally they would be 6 or 8" x 12" at lengths of 12,14' and 20' and a moisture content no greater than 12%. Framing will start by the end of September. I have shopped numerous suppliers in Alabama, Florida and Georgia but was hoping one of our GCMB posters might have knowledge of a small mom and pop source that might not advertise on the webz. My wood has much higher moisture content. My sister and brother-in-law bought an old warehouse in Savannah about 20 years ago. Have you checked with lumber salvage yards? Thats odd, hand lotion should prevent moisture intrusion. Creamer is a small one on CR 388, Panama City. They in Blountstown...isnt that where wilber was from? That's a weird mix of posts. Thinking the same thing... I don't think I posted in this thread. If I did, it was a major hiccup on the website. Like a dumbass it appears that I re-posted a quote from a previous conversation. Go fake. 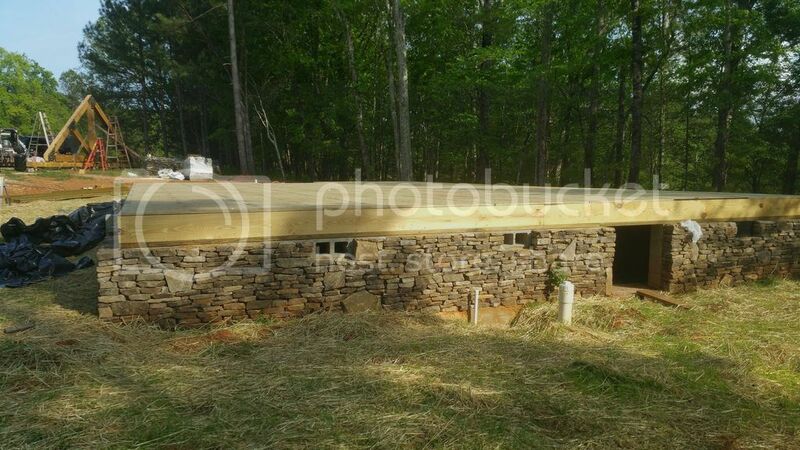 I bought their stacked stone panels for my outdoor kitchen. Update on the beams for my friends cabin. He found a small mill in SC that could provide what he needed. They finally started framing this Monday. Here is a picture of the foundation and subfloor. 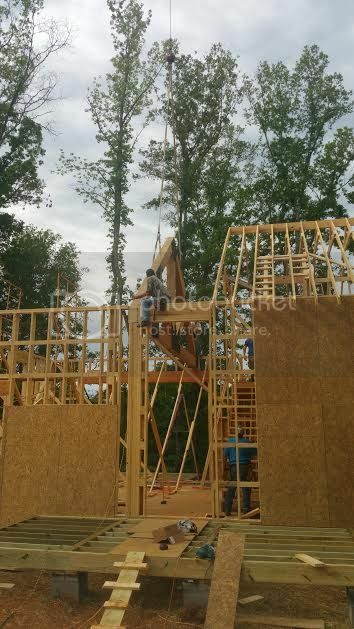 If you look in the upper left corner, we built one of the timber frame trusses from the 8x12 timbers. Price we got for the steel connector plates from a fabricator in Augusta was too high so we bought 3/8" mild steel plate and a plasma cutter and fabricated our own. Each truss is 28' wide and rises 10'-6" and weighs about 2600 lbs. Update on the beams for my friends cabin. He found a small mill in SC that could provide what he needed. They finally started framing this Monday. Here is a picture of the foundation and subfloor. If you look in the upper left corner, we built one of the timber frame trusses from the 8x12 timbers. Price we got for the steel connector plates from a fabricator in Augusta was too high so we bought 3/8" mild steel plate and a plasma cutter and fabricated our own. Each truss is 28' wide and rises 12'-6" and weighs about 2600 lbs. That's going to be nice. Don't know how I missed this thread. Would have offered some help, but not sure you would've wanted the freight charges from the west coast. Drywall was just finished this week and the trim crew apparently has been released by ICE from detention and are working at finishing the v-joint pine paneling and stair work. This shot from the loft area shows the timber frame trusses that were the original subject of this thread. This will be the screened porch when finished. This is a two way fireplace. Looking good Cooter. I hope they are paying you well for all that work and having to eat dead cat chink food. but its much to small to fill any opening.